'What was so special about Therese?' Here you will find a very simple answer. Every thing she did was done out of her love for Jesus. She wanted to give Him everything. That was the driving force of her life. If you go into churches you will find statues of St Therese show her wearing the brown habit and the veil of the Carmelite Order. Can you guess why there is only one picture of a Carmelite nun in this book? It is because her first 15 years were spent growing up at home, and at school, and with her family. She was outside the Convent for much longer than the time she spent inside its walls, and her little way of doing EVERYTHING out of love for Jesus is as important for boys and girls, as it is for nuns and priests, and mums and dads. After you have read Therese's story, see if you too can live as she did, in doing everything for God. You may find this little way of loving God will change your life! Little Therese Martin had four big sisters and lived at Alencon in France. Her father had been a watchmaker, her mother made lace, and every morning, long before we wake up, her parents went to Mass at 5.30 a.m..
Therese was part of a happy Catholic family. She was born on 2nd January 1873, and when she was two days old she was taken to church to be baptised. Her sister Marie was her Godmother. Marie was the eldest of the five girls and was nearly 13, Pauline was 11, Leonie was 9 and Celine was nearly 4. How happy they were to have a new baby sister, and to welcome her into their family and the family of the Church. When Therese was very small she was not as gentle as Celine; she used to want her own way - and when she could not have it, she threw tantrums, and rolled on the floor in a temper. But also she heard people say that Pauline would be a Religious. (A Religious is a Nun). And she thought, 'I too will be a Religious'. In her heart Therese wanted to be good, and to do the right thing for Jesus, and so He was able to change her. Celine and Therese always played together. Sometimes they went to the park, although Therese liked it best when they played in the garden. When she was a baby Therese had been looked after by a nurse called Rose. 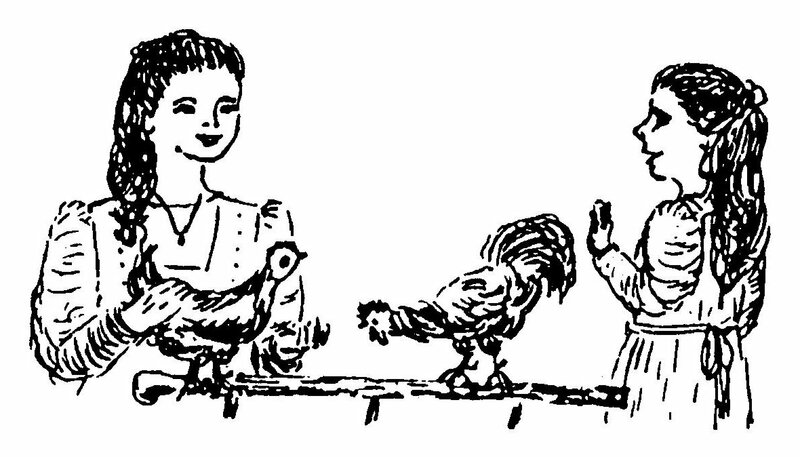 Rose lived on a farm, and had given Therese's mother a hen and a cockerel. Therese and Celine had these birds as pets, and talked together, as they sat enjoying being with them. One day, when Therese and Celine were playing, their sister Leonie brought them a basket filled with dresses and pretty materials for making doll's clothes. 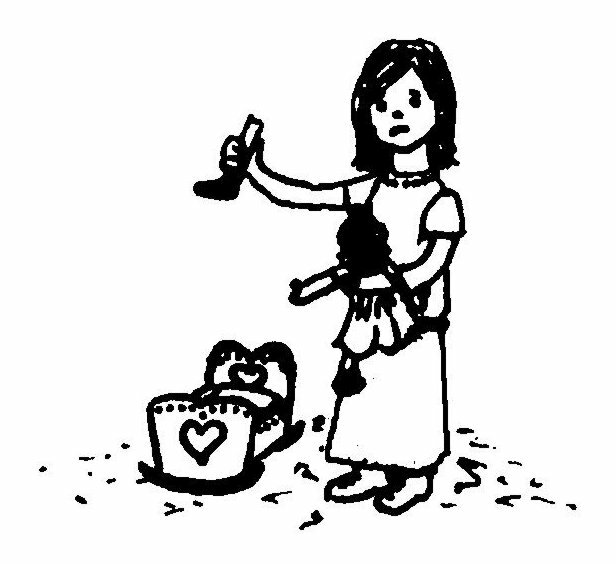 Leonie's doll was on top of the basket, because she had decided she was too old to need dolls or dolls' clothes. Celine chose a little ball of wool. Then it was Therese's turn to choose what she wanted. She thought for a moment, and then said, 'I choose all! ', and took the whole basket. When she was older Therese realised that how she had felt about the basket was a picture of how she felt about God. She wanted to have all He had to offer, and to do all for Him. She would never be happy unless she gave Him everything, and accepted all His love. She wanted to receive all that God wanted to give her, and she wanted to become a Saint because of her love for Him. 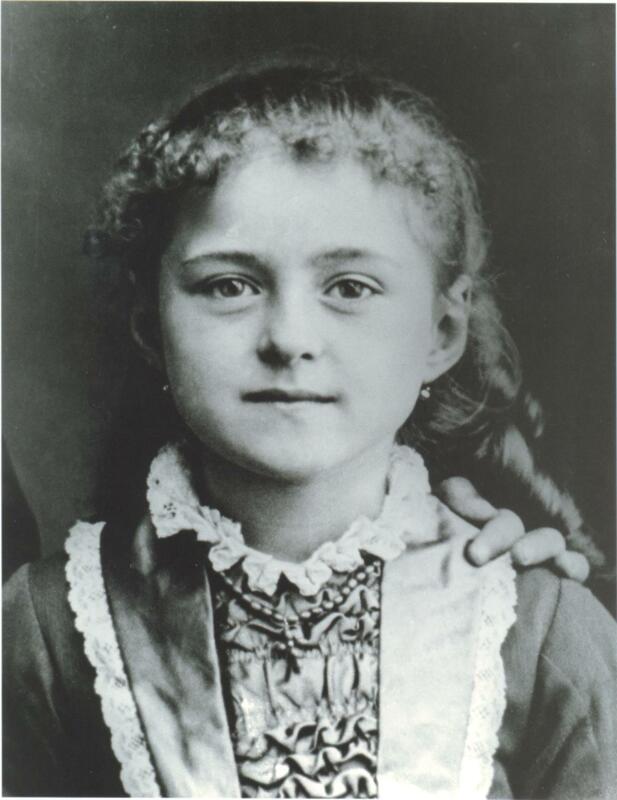 When Therese was only four years-old her mother became very ill. This made life very sad for Therese. She had loved her mother so much that she followed her everywhere in the house. The night before their mother died the five girls were with her when she was anointed, and that became a very precious memory for Therese. Soon after the death of their mother, Therese and her family moved from Alencon to Lisieux, so that they would be near their cousins, the Guerins. They travelled on the train to Lisieux and lived at a house called Les Buissonets. That is French for 'The Shrubberies'. The house had an English garden in front of it and a large vegetable garden behind it. Therese was happy to be moving there, and when the family arrived they were met by their cousins - Jeanne was nine, and her sister Marie was seven years-old. Here is a picture of Les Buissonets. By now Therese had become her father's little queen, and she thought of him as her king. Sometimes he took her fishing with him. She had her own little fishing line, but she liked it best when she just sat on the grassy bank among the flowers, thinking. These thoughts were what grown ups call 'Meditation', because really Therese was praying. She was thinking about Jesus and Heaven. She found that thinking about Heaven was so much lovelier than thinking about anything else. One day, on a fishing trip the weather changed. There was thunder and lightning. But it only made Therese feel closer to God. She was still small enough for her father to pick her up, and carry her safely home. At Les Buissonets Pauline used to dress Therese every morning. 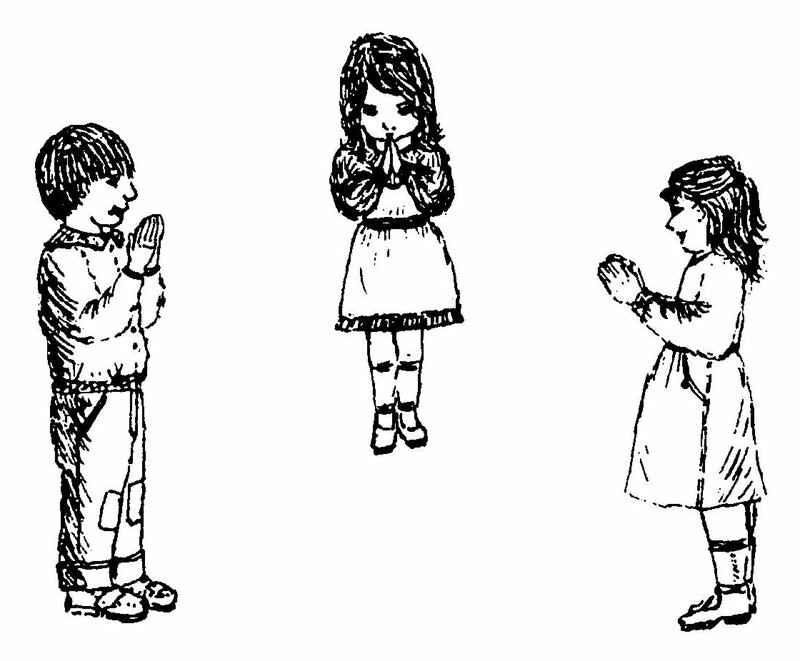 As she did so, Pauline talked to Therese about God, and then the sisters knelt together to pray to Jesus. After their prayer time Pauline taught Therese her lessons, and the very first word she learned to read was 'Heaven'. After her morning lessons Therese used to go for a walk with her father in the afternoon. Each day they used to visit a different church in Lisieux, knowing they were visiting the Lord Jesus, hiding in the white host that we call the Blessed Sacrament. That was how Therese first came to visit the chapel of the Carmelite Convent. Here they are praying together at the altar rail in the Carmelite chapel. 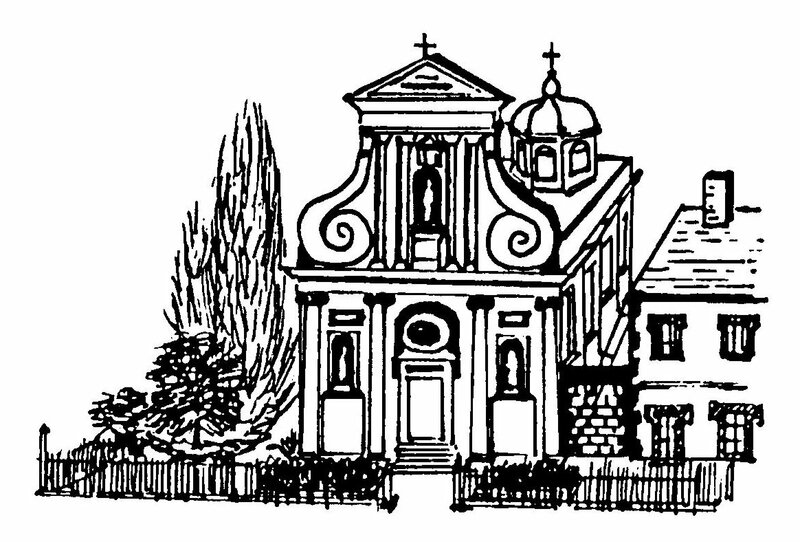 Then, very quietly her father showed her the Choir grille, which was like a crisscross fence with holes in it, separating the chapel from the part of the building in which the Carmelite Nuns prayed, and yet allowing the Carmelites to see the altar through it. Her father explained that the Nuns were behind it, and that they lived in the Convent, in order to live their lives completely for God, and to pray for everybody. After her afternoon walk each day, Therese did her homework, and then she liked to play in the garden. 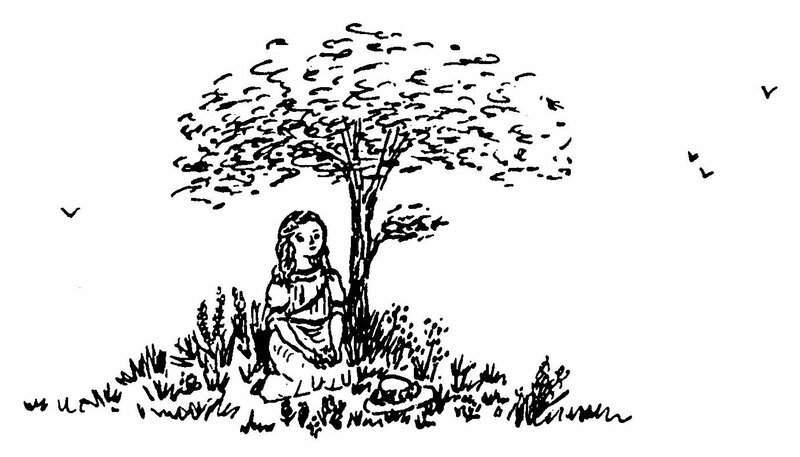 She liked to make mixtures with little seeds and pieces of bark from trees, which she found lying on the ground, and put into a cup. Her father then pretended to drink them. Therese also grew flowers, and she made little altars along the garden wall. Then she fetched her father, and led him with his eyes closed. When she said he could open his eyes he gazed in wonder at what she had made. How much her love meant to him! Therese loved Sundays. She looked forward to going to church, hand in hand with her father. Sunday was God's special day, and a day of rest. 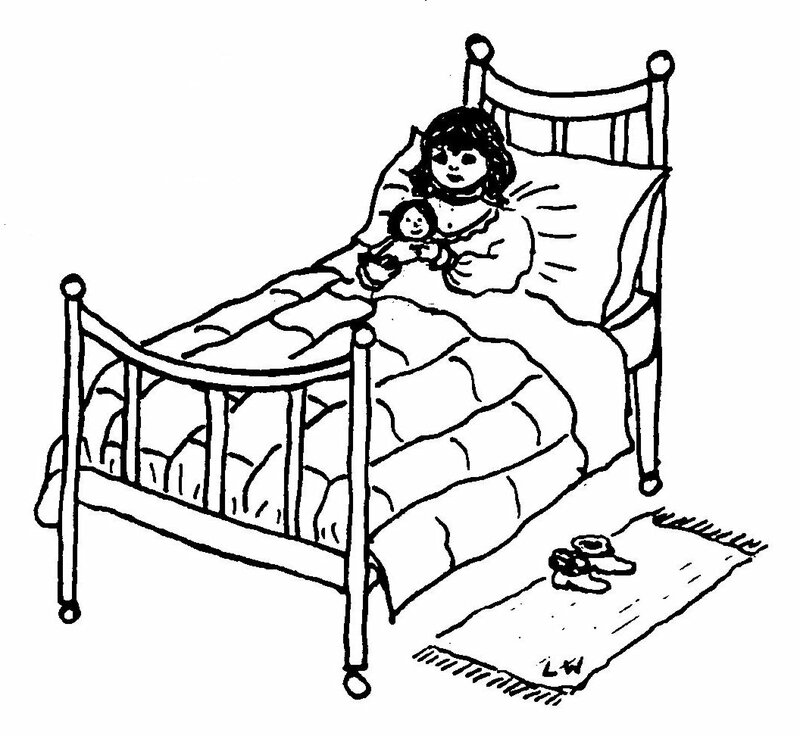 It meant getting up a bit later, and before she got up Pauline brought her a drink of chocolate in bed. It meant dressing up in best clothes, although Therese did not much like having her hair curled to please her father. Then, all the family went to Mass. But when Sunday night came, Therese felt sad as they said Compline (the Night prayer of the Church) together. SUnday was ending, and she longed for the everlasting Sunday of Heaven. 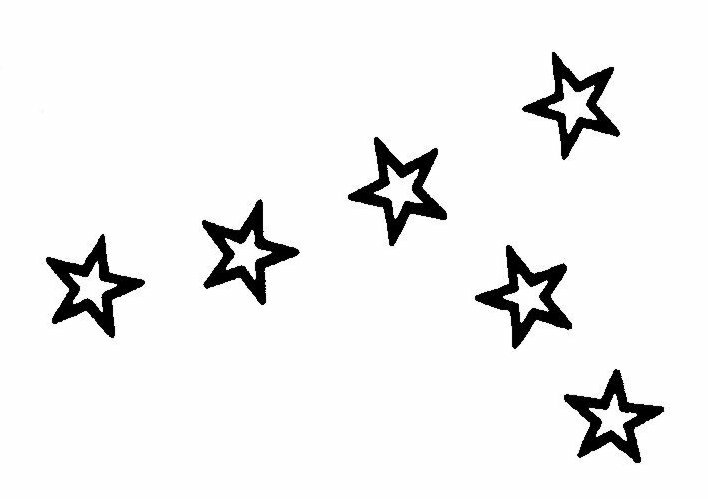 One Sunday evening, as Therese walked home from her cousins' house with her father, she noticed the stars. A group of stars that are called 'Orion's Belt' caught her attention, because they looked like a letter 'T'. Therese pointed to them, and told her father that her name was written in Heaven. Therese's First Confession was very special. Pauline prepared her for it, and afterwards she was full of joy. She knew she had made her Confession to the Lord Jesus and He had forgiven her through His priest, Father Ducellier. Each night, at bedtime, Therese would ask Pauline if she thought she had been very good that day. Therese was so sure of the need to be good, that she would have cried and cried if she had been bad. After her question was answered Pauline and Marie kissed her good night and went downstairs. It was then, when Therese was alone in her dark bedroom that she became very frightened, but she overcame this fear with Pauline's help. She was freed from her fear by Pauline sending her to other rooms in the house at night to fetch things for her, and so she stopped being afraid of the dark. One day, when Therese's father was away, something very strange happened. She was about six years-old. In the middle of the afternoon she was looking out of an attic window into the garden. There she saw a man, dressed exactly like her father. He looked like her father, and walked like him - except he seemed to be stooping, and his head was covered with an apron that hid his face. Thinking it was her father, Therese called to him, 'Papa! Papa!' She watched him walk to a grove of trees, but then, to her astonishment she did not see him come out from the other side of the trees. Pauline and Marie went with Therese into the garden to look for the man. But there was nobody there. Really no person was in the garden, Therese had been given a view of her father as he would become some years later, because before his death he became very ill, and looked like the man she saw in her vision. This was God's way of showing her something she would not understand for many years. Therese learned her lessons from Pauline until she was eight and a half years-old. Then she was sent to school. 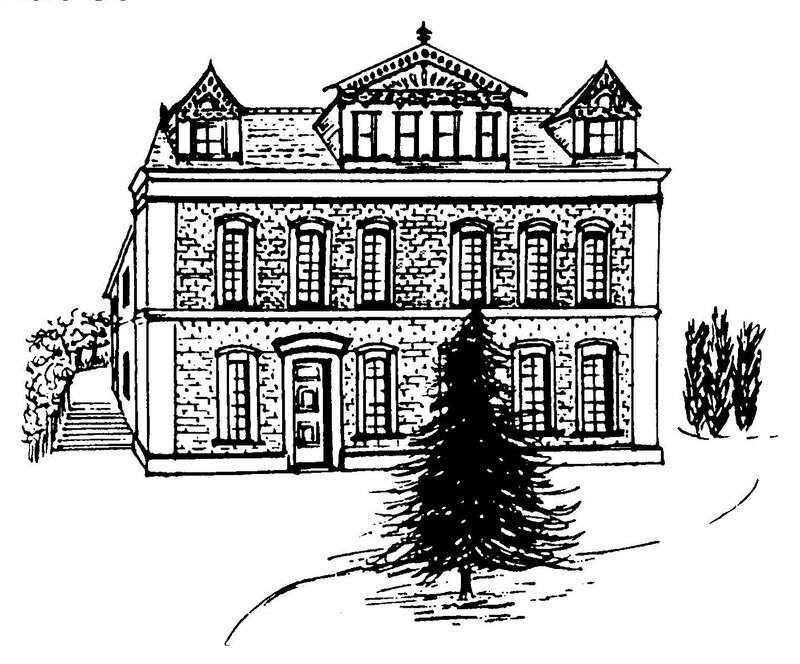 The school was a Convent. Therese knew more than the other children of her age, and so she joined a class of older children. She did not enjoy school at all. Later she said, 'The first five years I spent in school were the saddest in my life'. Since the death of her mother, when she was four, Therese had been very easily frightened, and very sensitive. (That means her feelings were hurt very easily.) 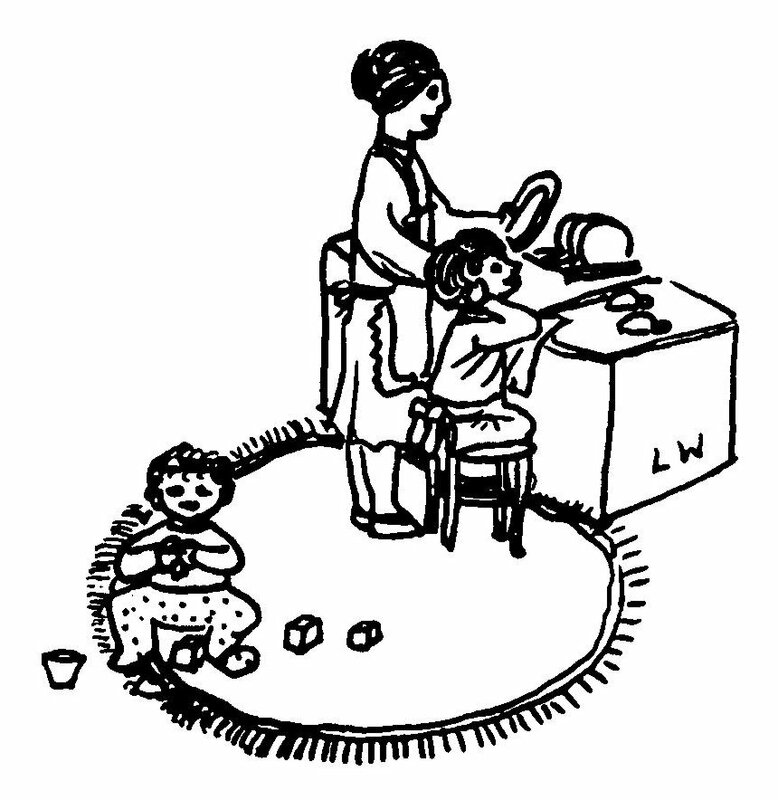 She found it hard to play with other children, because she was so used to being only with her family. She liked playing with her cousin Marie, when they played on their own. 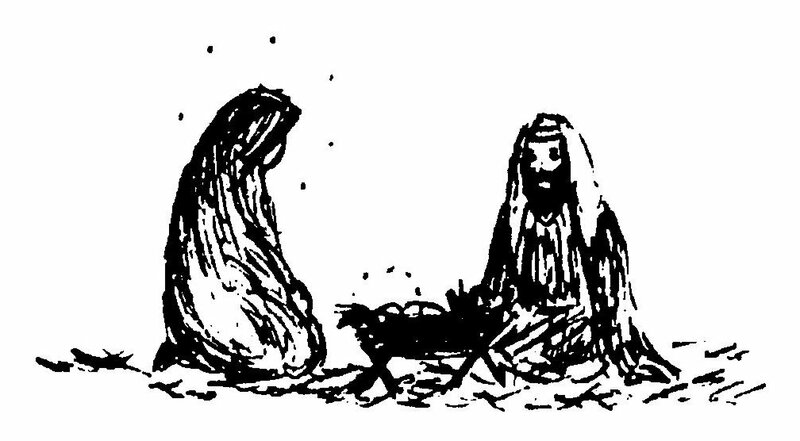 Sometimes Therese and Marie pretended they were hermits praying and looking after the garden. Hermits are people who decide to live a life of prayer, and live apart from other people, away from the world. Once the children decided to play a game of pretending that they could not see, and, because they had their eyes shut on their way home from school, they walked into some boxes outside a store, and knocked them over. 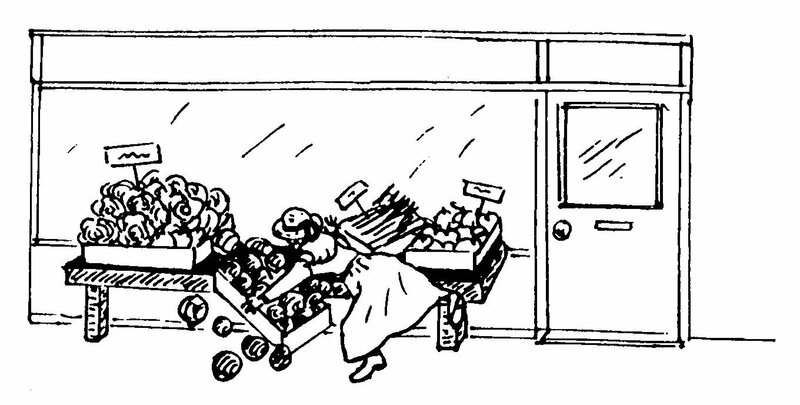 Marie's sister Jeanne, and the shop keeper were really cross about that! Therese and her sister Celine remained very close in their friendship with each other. Celine was three years older than Therese, and had become a little rascal, and Therese was a sweet little girl who cried too much. They used to play together with dolls, and go shopping to buy little gifts. Therese had something very hard to bear when she began her second year at school. She was nine years-old, and the day before the new term began her big sister Pauline, who had been a mother to her, left home to enter the Carmelite Convent at Lisieux. Therese knew very little about Lisieux Carmel when Pauline left home, but it was through knowing that Pauline was going there that Therese felt Jesus wanted her there too. Therese had always told Pauline her secrets, and so when she told Pauline that she wanted to go to Carmel, arrangements were made for Therese and her cousin Marie to see the Mother Prioress there. The Mother Prioress believed in Therese's vocation. That means she believed that God was calling Therese to enter Carmel, but she had to tell her that a child of nine was too young to leave home and become a nun! As Therese's own mother had died when she was only four years-old, and now Pauline had left home, Therese felt she had lost her second mother. And it happened only a year after she had started going to school, which she did not like. Life was full of sadness, and soon she became ill.
Therese became so ill that her father thought she was going mad, or that she was about to die. But then she surprised everybody by being well enough to go to Carmel, and see Pauline, on the special day of her clothing. 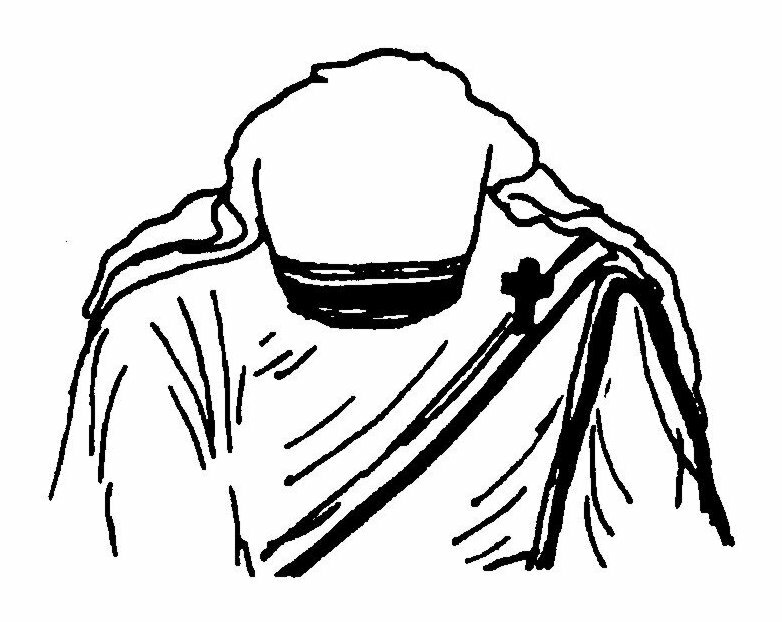 That means she visited on the day when Pauline was clothed in the brown Carmelite habit for the first time. But the day afterwards Therese became too ill for me to describe. Her father had special Masses said for her in Paris. Then one day something very precious happened. 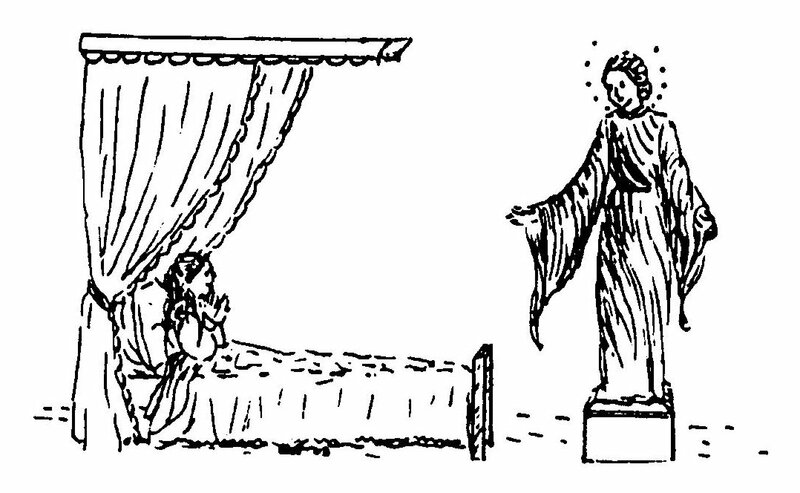 Beside Therese's bed there was a figure of Our Lady, and, as the children turned to her in prayer, into the blackness of Therese's illness came Our Lady's smile. Therese saw that figure smile, and with her smile Therese became well. After a visit to Alencon to see friends and relatives Therese spent three months preparing to make her First Holy Communion. 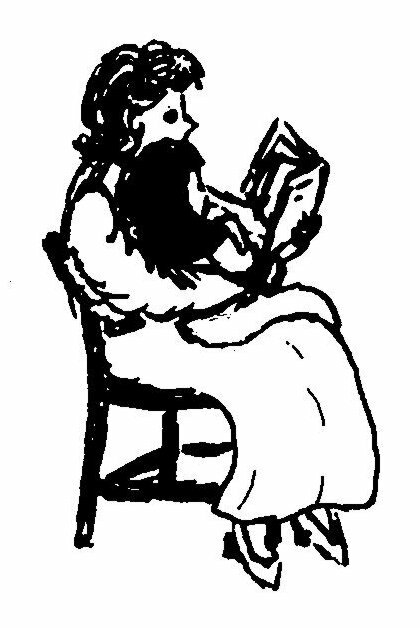 She was no longer able to sit on Pauline's knee and learn from her each evening, because Pauline was living in the Carmelite Convent. 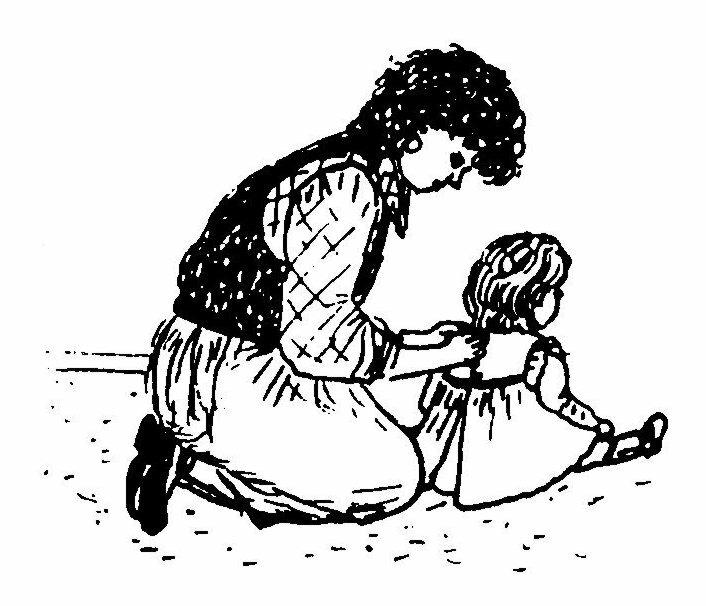 But Pauline sent her a letter every week, and instead she was able to sit on the knee of her eldest sister Marie, and Marie was her Godmother. Especially during this time Therese made little sacrifices for Jesus. This means that she tried very hard to give Him all the little things she could. Everything was done by her to please our Lord. When Therese had some spare time in which to be alone, she used to like to go into a place behind her bed, where she could be alone and hidden. 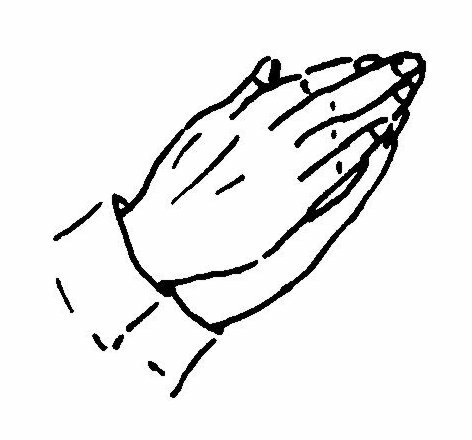 There she thought about God, and in secret He was teaching her to pray. For three days before making her First Holy Communion Therese stayed at the Abbey school for a Retreat. A Retreat is a special time in which a person can come to know Jesus better. Then came the day which Therese called the most beautiful day of her life. She saw her First Holy Communion as very special indeed. It was the moment when she and Jesus became one, as she received Him. She wrote, "Jesus alone remained; He was the Master, the King." Therese was so happy that she cried. Therese's friends thought she was crying because her mother was not there on her special day. Really Therese was so close to Heaven on that day that she knew the closeness of her mother too. Only joy filled her heart - a joy so great that it brought tears to her eyes. That evening Therese and the family went to the Carmelite Convent, because on the same day as her First Holy Communion Pauline made her Profession as a Carmelite nun. Pauline promised to be the Bride of Christ, and Therese saw her sister in her white wedding veil wearing a crown of roses. How happy they both were! After special blessings, difficulties can follow. By the next day Therese was still knowing the loveliness of her First Holy Communion, but already she was wanting to receive Jesus again in that way. In those days people received Holy Communion much less often than we do now. Therese was deeply grateful to be given permission to receive the Sacrament again a month after her First Holy Communion. It was the Feast of the Ascension. Again Marie prepared Therese to receive Jesus, and she told her that probably Therese would not walk the way of suffering, but God would carry her like a child. The day after her second Communion Marie's words came back into Therese's thoughts, and she knew, deep down inside herself a great desire to suffer. She prayed for bitterness, not sweetness, in her life. Therese knew that by suffering she could help Jesus to help other people. The next big occasion for Therese was her Confirmation. On that day Therese knew she was receiving the Holy Spirit, and the strength that she would need to suffer for her Lord. School continued for Therese, but she did not find it easy to make friends, or to play, and at her uncle's house she found that the family thought she was not very clever. The suffering that she wanted had begun. She never did anything bad, but she realised that this was only because God in His goodness had stopped her from being bad. She knew that without His help she would have been a terrible person. She began to wonder whether all her thoughts were really right or wrong. She only wanted to please Jesus, and not being certain whether she was pleasing Him or not was like torture to her. It was Therese's big sister Marie who helped by listening to all her problems, while she was curling her hair for her each night. Marie was the person to whom Therese went for help. You can imagine how hard it was for Therese, when she learned that Marie, like Pauline, was entering Carmel. Before Marie left home, Therese left school. She was only thirteen years-old, but now that Celine had finished her schooling, Therese could not bear to be at school without her. 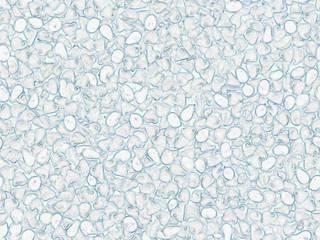 Soon she suffered from so many head aches that her father arranged for her to leave. After that, Therese was taught lessons by a lady, instead of attending school. That October, on the Feast of St. Teresa of Avila (15th October) Marie entered Carmel. Now Therese had no human friend with whom to share her worries, so instead she turned in prayer to her four little brothers and sisters in Heaven, who had died before she was born. She talked to them and asked them to help her to find peace of mind, and Jesus answered their prayers. Therese's worries and fears went away, thanks be to God. After Marie went into Carmel Therese still cried very easily. She was nearly fourteen years-old, but in her behaviour she was still like a baby in some ways. She let Celine tidy the house. If Therese helped at all, she became upset if people did not thank her when she made her bed occasionally, or watered the plants. She was not grown up at all! Can you imagine a person like that entering a Carmelite Convent to become a nun? That Christmas Eve something very special happened. Somehow Jesus changed Therese completely. In a moment all her touchy behaviour stopped, and she knew she had been changed, and so she called that night her Conversion. That word means that Therese was set free from her own ways and changed, so that she became as Jesus wanted her to be. It happened after Midnight Mass on Christmas Eve. 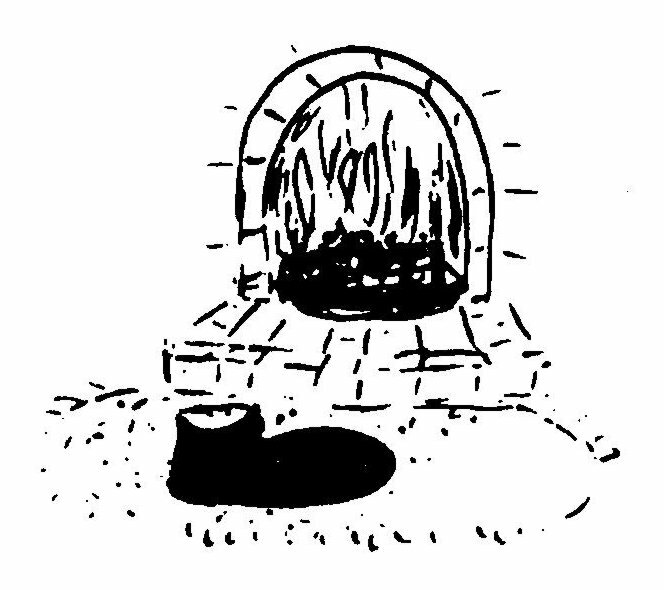 French children leave their slippers by the fireside, so that they can find them filled with gifts on Christmas Day. After Mass Mr. Martin was tired, and Therese overheard him telling Celine that it was a good thing that it was the last year that Therese's slippers would need filling. Celine was very worried that their father's words would upset Therese and make her cry. Instead, in a moment, Therese grew up. She did not cry. The words pierced her heart, but she stopped her tears from coming, and she went into the room a different person. She had become strong for Jesus, and she would be like that all her life. She stopped thinking of herself. From then onwards she forgot herself, and thought of others. Her one wish was to win souls for Jesus. Soon after that experience Therese asked Jesus for something special. A murderer was being hanged because he had killed three people. Therese wanted a sign from God to show her that he had turned to the Lord before he died. Just before his death the murderer Pranzini kissed the crucifix. Therese knew her prayers were heard and had been answered. Earlier the same year, at Pentecost, Therese had asked her father if she could enter Carmel. 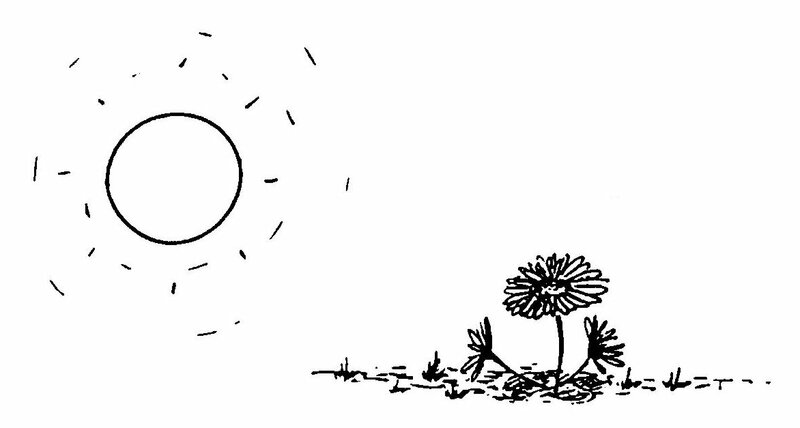 He gave his permission, and as they were in the garden when she asked him, her father picked a white flower, and gave it to her. As Therese accepted that flower, and saw that it had been pulled up by its roots, and taken right out of the soil where it had been growing, she knew that she was being picked by Jesus - just as her father had picked that flower - and moved, from her home to be replanted at Carmel. You might think that, because Therese's father had said she could enter Carmel, the way ahead was now open to her. But firstly, she had a number of problems to face. When she told her uncle about her vocation he said that no way could she go to Carmel until she was older. 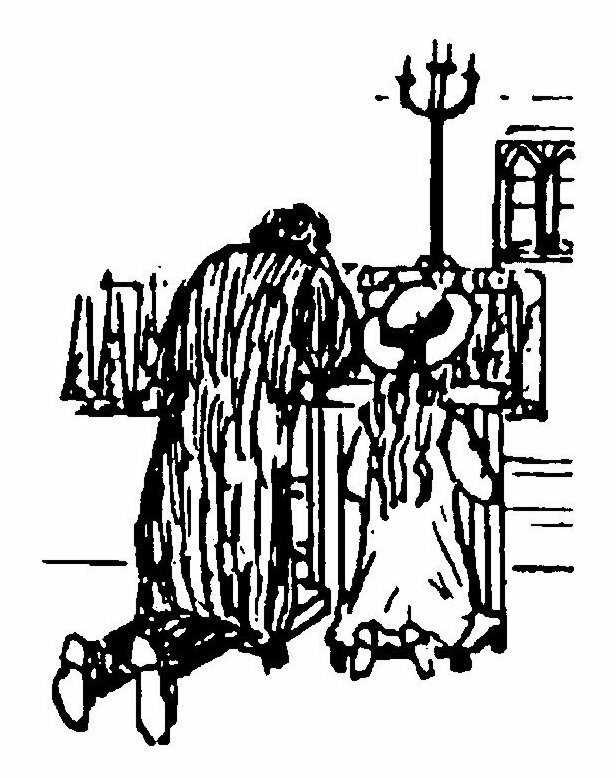 His words came as a shock, but Therese went on praying, and, amazingly, her uncle changed his mind. After that, Therese had to see the priest who was Carmel's Superior. He was not happy for her to enter Carmel when she was so young, and so he sent her to the bishop. But the bishop would not give an answer straight away. So Therese made up her mind that she would go with her father and Celine on a pilgrimage to Rome, and speak to the Holy Father, the Pope, and ask him! Therese said that when that happened she felt like a toy ball with which the Child Jesus played, and now it seemed as if Jesus had left the ball alone on the ground. But, you see, Therese had longed to be a toy for Jesus, and so she kept on hoping and praying that very soon her longing to enter Carmel would come true. It did! That Christmas when Therese went to Carmel and saw her sisters there, she was given a little figure of Jesus, holding a ball on which was written the name Therese. Just a few days later Therese received the news she wanted so much. She was told that she must wait until after Lent, and THEN she could enter Carmel. Therese found it very hard to wait until April before she entered Carmel. At last her final day at home arrived, and that evening all the family came together for an evening meal. As they sat round the table Therese found it difficult, because she knew that she would never meet with them there again. She was 15 years-old. The next morning her father and she went arm in arm to Carmel, where again the whole family were together to hear Holy Mass, and receive Holy Communion. Therese was aware that her relatives were sobbing softly, and her own heart was beating loudly, as she went to the door to go into the Convent. Then she knelt down to receive a Blessing from her father, and in tears he knelt to bless her. For Therese a very special life had now begun. Life inside a Carmelite Convent is not like life in some other Convents where Sisters go into the world to teach or nurse. The life of a Carmelite Nun is taken up with prayer in order to help win souls for Jesus. Carmel is an enclosed Order. That means that the Nuns do not usually leave their Convent to do shopping, or to have a holiday, or to go home to see their families. They stay inside their own house (Convent) and grounds. They leave the world outside because they want to give up everything in order to follow Jesus. 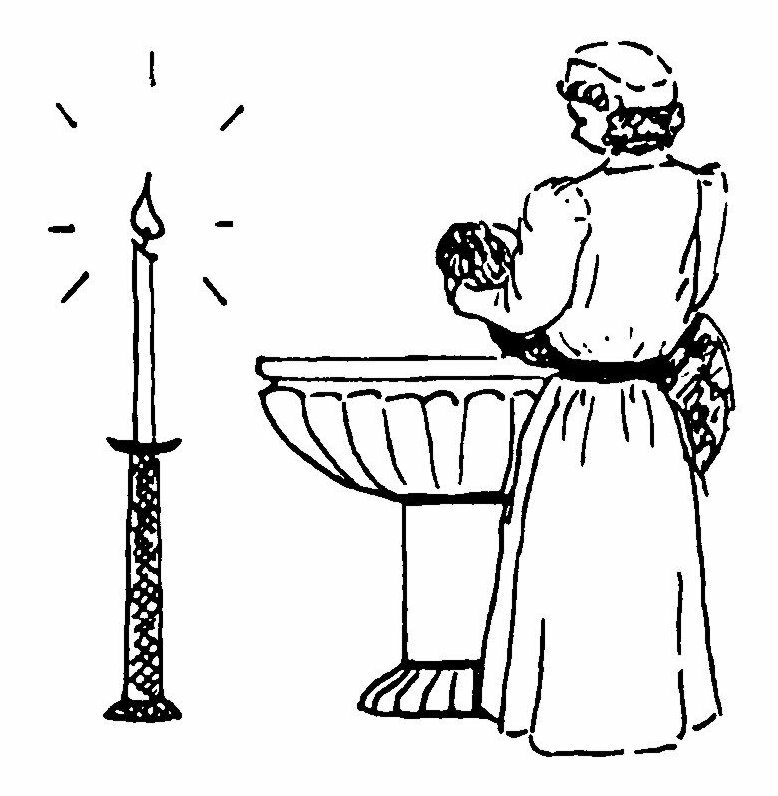 When they have visitors they meet them in the Parlour, and in Therese's Carmel a grille separated the Nuns from their visitors. A grille is a partition with holes in that looks a bit like a portcullis on a castle. Each Sister has a bedroom called a 'cell'. This is where she sleeps on a straw mattress and spends time reading and praying. At other times she attends Mass, and says the Divine Office, which is the prayer of the Church, in Choir. Choir is the Nun's part of their Chapel. There is very little talking inside Carmel, because the Sisters offer their silence to the Lord. They become the Brides of Christ, and, like all housewives, they do their house work. They clean the house and Chapel, and they do the gardening for Jesus too. Sisters go to Carmel because they know that is where Jesus wants them to be. Therese said she had come to Carmel 'to save souls, and especially to pray for priests'. Today people are still called by God to enter Carmelite Convents. 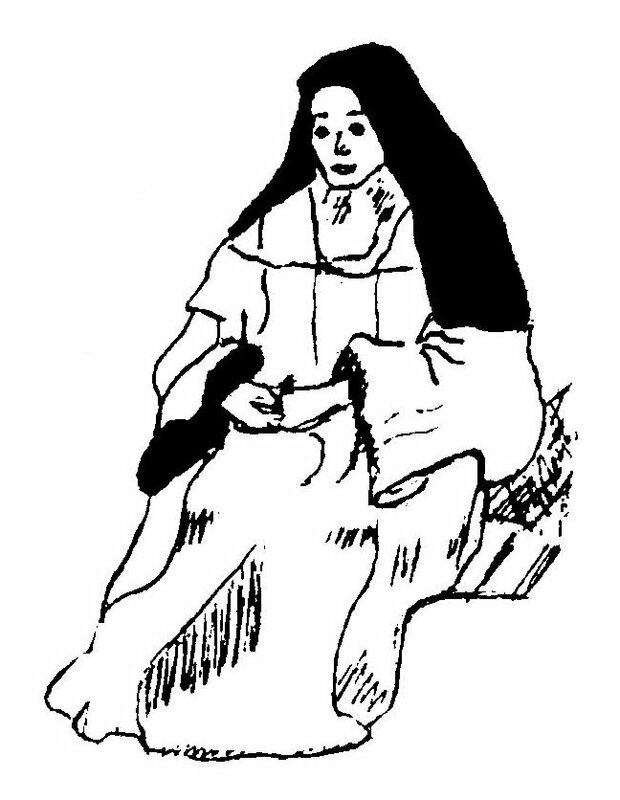 The January after Therese entered Carmel the day came for her Clothing. This was the day when, like her sisters Pauline and Marie before her, Therese was clothed in the brown Carmelite habit. Therese was so happy on the day of her Clothing. She said she was 'A little winter flower' for Jesus. She had not expected her father to be able to be there, as he had been ill, but to her delight, he came. She had always longed for it to snow on this particular day. It did not look as if it would snow, but how happy she was when it did! She saw the snow to be a special gift to her from Jesus. 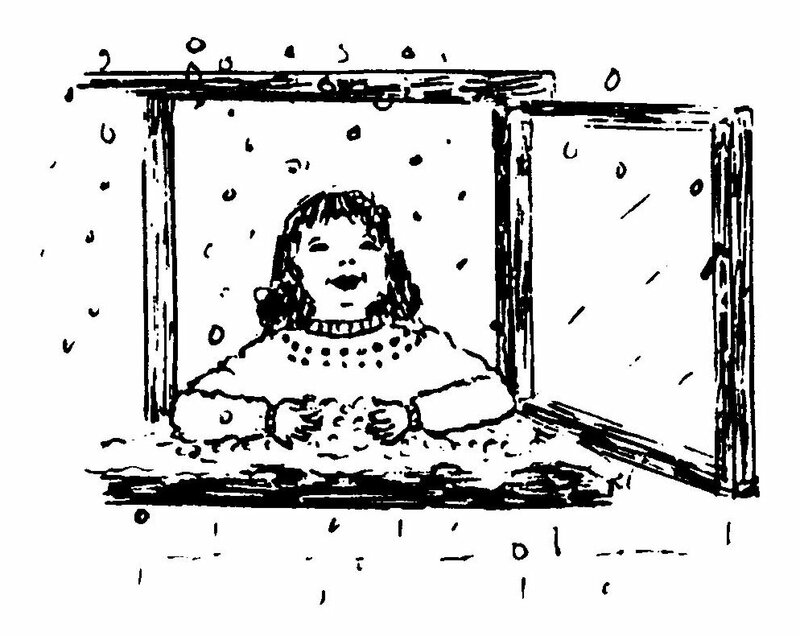 Ever since she was a tiny child Therese had always liked snow. After her Clothing Therese was a Novice. That is the name given to nuns before they make their Profession. A nun's Profession day is like her wedding day, because on that day she gives herself to Jesus to be His bride. Poor Therese had to wait quite a long time before her Profession, but all the time she was waiting she was learning, and she said to her Lord, 'I will wait as long as You desire'. On Our Lady's Birthday, 8th September, in 1890 Therese made her Profession, and then, two weeks later, she received the Veil that was the sign that showed that her life was being lived as the spouse of Christ. That day was tinged with sadness, because Therese had very much wanted her father to be there. He was too ill to come. 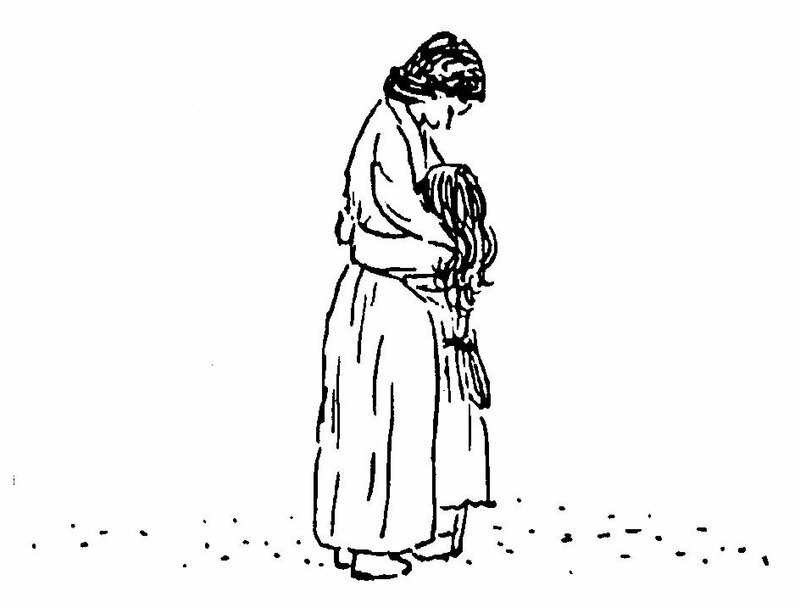 But Therese was doing exactly what Jesus wanted her to do, and so in her sadness she also knew Peace. 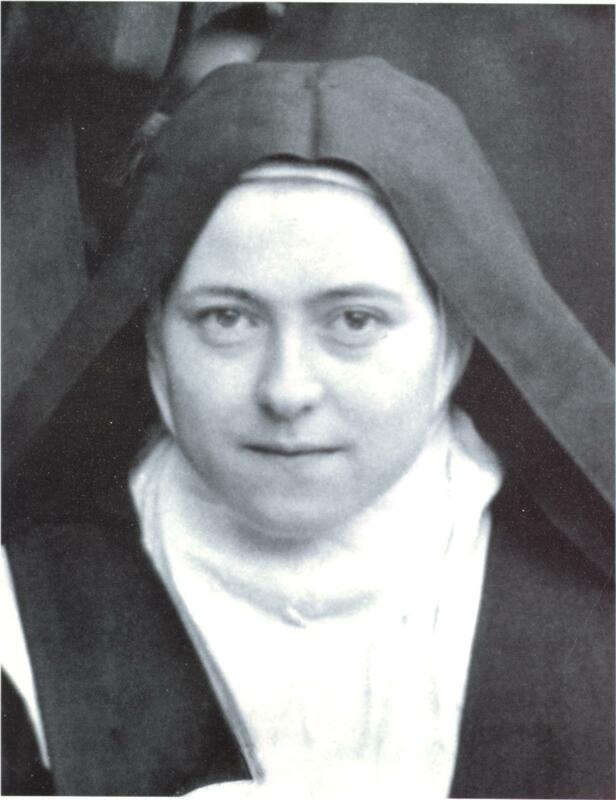 Her name was now Sister Therese of the Child Jesus and of the Holy Face. She belonged to the Child Jesus, but she also belonged to the suffering Jesus, whose Face showed the pain and sorrow of the Cross. Therese wanted to be like Jesus in every way. Therese spent nine years living inside Carmel, before she died at the very young age of 24. In those days people did not live as long as they do now, a hundred years later, and Therese had a nasty disease called tuberculosis. Now when people sometimes have that illness, doctors can help cure them, but in those days there was no cure, and very often people died from it. Therese's life in Carmel was hidden. She did nothing special. In fact, some of her Sisters in the Convent did not think she was special in any way. What made Therese secretly special was that she did EVERYTHING out of love for Jesus. Therese taught us that, 'It is love alone that counts'. Her little way of loving Jesus in every action can be lived by all of us. Mother Teresa of Calcutta was given the name Teresa because of St. Therese of Lisieux, and she also lived her little way of love. However young or old we are we too can all do little things well for Jesus, whether it is making a bed, washing up, or sharing toys with other children. If we are well we can do things for Jesus, and if we are ill we can offer to Him our suffering, trusting Him to use that to help other people. That is what Therese did. Nobody is too small, and nobody is too big to give love to Jesus. We can always live this little way of love, and it can go on for ever and ever on earth and in Heaven. Before Therese died she said that her work for Jesus was about to begin. She saw that in Heaven she would be able to do more for Him than she could do here on earth, and she decided, 'I will spend my Heaven doing good on earth'. That is why we can turn to St. Therese now and ask her to help us to love Jesus and to draw souls to Him. Have a little talk to her, and then just wait and see what happens. St. Therese please pray for us. Help us to be what Jesus wants us to be, and do what He wants us to do. Lord Jesus we love You. Amen.